We are delighted to announce the publication of a short piece in Journal of Eukaryotic Microbiology presenting the UniEuk project. There you will find a description of the full UniEuk system, composed of three main modules, designed to facilitate participation of the whole community to build the UniEuk taxonomic framework. We are very grateful to the journal’s editor Roberto Docampo and the International Society of Protistologists for this great opportunity to further advertise the project. The three main UniEuk modules are in the process of implementation. The full UniEuk system will be demonstrated to the community at the next joint International Congress of Protistology (ICOP 2017) and Annual Meeting of the International Society of Protistologists in Prague, Czech Republic, July 30 to August 4, 2017. We encourage all congress participants to attend the UniEuk session that will take place the afternoon of Thursday August 3, 2017. After this, the project will be ready to interact with those of you not yet involved: especially experts in protist biodiversity and taxonomy! You will soon be able to register on our contact page. Follow this news section to be kept updated when the various functionalities of the system become available. The UniEuk workflow. 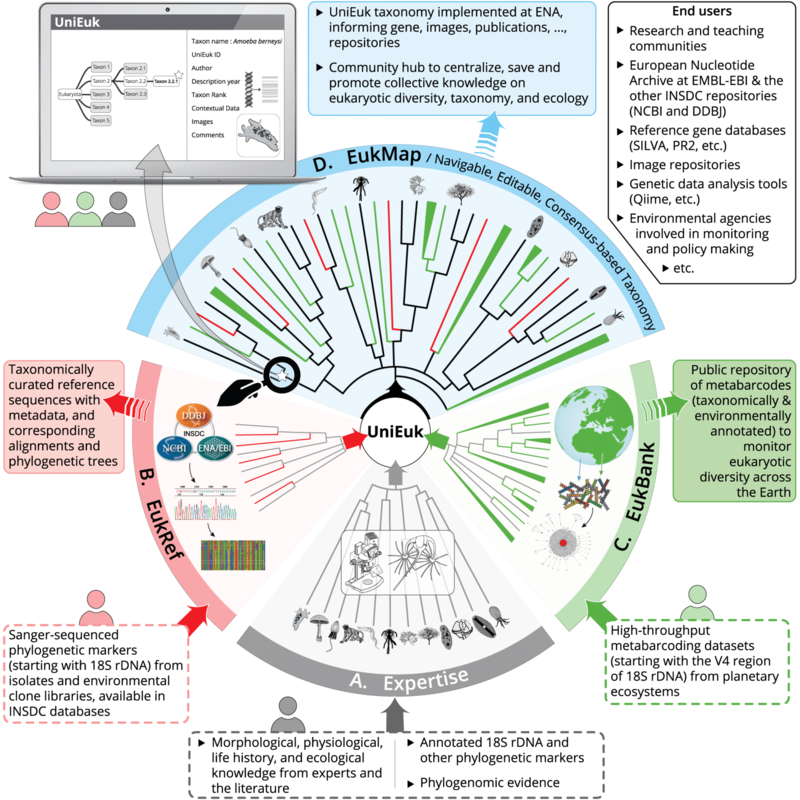 Bottom-up, community-based information on eukaryotic biodiversity from (A) classical knowledge, (B) phylogenetic diversity, and (C) environmental ‘-omics’ surveys, converge and synergize through the UniEuk modules to inform the navigable and editable, consensus-driven taxonomic framework (D). Dotted and colored frames indicate input and output information, respectively. Line drawings of eukaryotes adapted with permission from https://genev.unige.ch/system/pawlowski/lab/tree.png. The UniEuk workflow. Bottom-up, community-based information on eukaryotic biodiversity from (A) classical knowledge, (B) phylogenetic diversity, and (C) environmental ‘-omics’ surveys, converge and synergize through the UniEuk modules to inform the navigable and editable, consensus-based taxonomic framework (D). Dotted and colored frames indicate input and output information, respectively. Line drawings of eukaryotes adapted with permission from https://genev.unige.ch/system/pawlowski/lab/tree.png.